Having played to millions of people around the world, at vast parties of his own on Brighton beach, in Brazil and during the 2012 London Olympics Opening Ceremony, there really is no one quite like Fatboy Slim so we are very excited that he will be headlining the Sankeys Soap room. Alongside him we have the legendary Basement Jaxx returning after their first sell out show at the launch of Sankeys Warehouse where they played a one in a life time b2b set alongside Armand Van Helden. The Soap Bar will also play host to house icon Todd Terry who will play a three hour 88/89 dance set. Boston Bun and Busy P from Ed Banger records who will be laying down some serious dance floor fillers. Next up we have M-Groove, Bhavin who will be playing a Disco & House. Joining the Basement is Spanish dynamic house artists Hector Couto and Mar-T both residents at Amnesia. Tribal Sessions original resident Greg Vickers & Jozef K do another a back to back set after their amazing debut at Sankeys Warehouse in October. Manu Gonzalez, will also be joining them, one of the main Tribal Sessions residents at Sankeys Ibiza this summer, he was awarded best newcomer at the DJ Awards in 2015 and just been nominated as best Spanish Tech House DJ in the vicious awards and after the killer set he did at the launch party it was a no brainer to bring him back for NYD. Next up we have the Redlight Room and we are extremely excited to announce that we have German duo and Sankeys Ibiza favorites Tube & Berger taking over the dance floor for another memorable set. Netherlands based, Defected Records resident Franky Rizardo also brings his ‘Snappy House’ sounds to the room. And weekly Redlight residents Matt Jam Lamont (The Godfather of Garage) & Sam Holt (Copyright / Strictly Rhythm). Matt Jam Lamont will be performing a rare 90s Sankeys Garage mix exclusively for the room. David Vincent says ”I have waited 10 years to produce events like this once again. 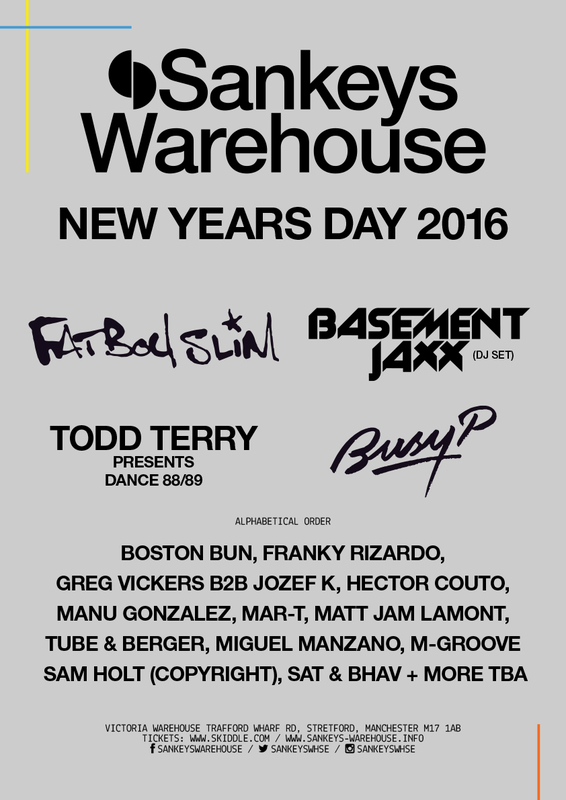 The first show at Sankeys Warehouse was nothing short of amazing and every comment I read was so positive. I just want to create parties for people to remember for the rest of their lives”. When you have iconic artists like Fatboy Slim, Basement Jaxx, Todd Terry & Matt Jam Lamont you are off to a good start to achieve this goal. Tickets for this event are moving very fast, this is a party not to be missed so recommended to purchase tickets early to avoid disappointment. Final Release Standard Tickets available now 35 Pounds + bf.